For other uses, see FA Cup (disambiguation). Many[who?] 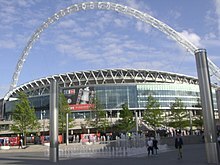 expected BSkyB to make a bid to show some of the remaining FA Cup games for the remainder of the 2009–10 season which would include a semi-final and shared rights to the final. ESPN took over the package Setanta held for the FA Cup from the 2010–11 season. The 2011 final was also shown live on Sky 3D in addition to ESPN (who provided the 3D coverage for Sky 3D) and ITV. Following the sale of ESPN's UK and Ireland channels to BT, ESPN's rights package transferred to BT Sport from the 2013–14 season. 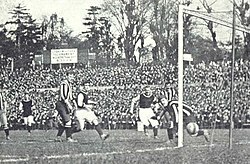 ^ "Oldest football cup 'not for sale'". BBC News. 14 October 2014. Archived from the original on 5 November 2017. Retrieved 4 November 2017. ^ 20 November – Mac o' Nine Tales[permanent dead link], On This Football Day. ^ "beIN SPORTS Kembali Siarkan Pertandingan FA Cup di Indonesia". beinsports-id (in Indonesian). Retrieved 15 March 2019.